If you’ve been paying attention (pop quiz later! kidding, kidding. 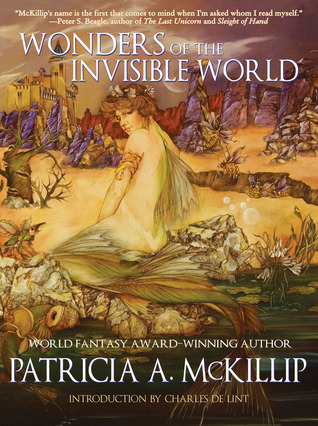 ), you know I’m a devoted fan of Patricia McKillip. She of Alphabet of Thorn, The Forgotten Beasts of Eld, The Bell at Sealey Head and The Bards of Bone Plain, to name a few that I’ve reviewed here. Each of her books has its own charm, but the threads of enchantment and dream-like prose guarantee that I keep coming back for more fantastical writing. On another note, I’ve also developed a love for the short story form as I’ve gotten older (and have shorter stretches of time free to spend immersed in books). 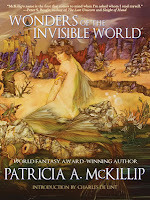 This upcoming title combines the best of both loves in one package: short stories by Patricia McKillip. I may die of happiness. Wonders of the Invisible World will be published by Tachyon Publications, and releases on October 1st, 2012. Stylistically rooted in fairy tale and mythology, imperceptible landscapes are explored in these opulent stories from a beloved fantasy icon. There are princesses dancing with dead suitors, a knight in love with an official of exotic lineage, and fortune’s fool stealing into the present instead of the future. In one mesmerizing tale, a time-traveling angel is forbidden to intervene in Cotton Mather’s religious ravings, while another narrative finds a wizard seduced in his youth by the Faerie Queen and returning the treasure that is rightfully hers. Bewitching, bittersweet, and deeply intoxicating, this collection draws elements from the fables of history and re-creates them in startlingly magical ways. Top Ten Tuesday is a meme hosted by The Broke and the Bookish, and although I’ve never participated before, I love reading the entries of my blogging friends who share each week. Today seemed like the day to make a change, and I’m here with my Top Ten. If you’d like to play along, check out this post. 1. I once racked up $142 in library fines… and didn’t pay them for a year. I took out an inter-library loan and didn’t return it for 3 months. Fines of $1/day, plus late fees… yeah. Thankfully, the Arlington Library System took me back once I paid! Sweet relief. 3. I read equal amounts of romance and YA fantasy/sci-fi, but you’d never know it from my blog or Goodreads. Closet Betty Neels and Georgette Heyer fanatic, for sure. 5. I love writing about books on my blog, but the most popular posts are the food recipes. 6. Middle grade may soon supplant YA as my ‘favorite’ genre. 7. I have a difficult time reading and reviewing sequels for my blog. I don’t want to ruin a first book for anyone, and it’s tricky to avoid giving away plot points. 8. If I know a book will be sad, it sometimes takes me months to read it. It doesn’t matter how stellar the reviews or how massive the publicity – I’ll drag my feet (see: Code Name Verity by Elizabeth Wein and Between Shades of Gray by Ruta Sepetys). 9. I hate breaking the spines of books I buy new. I want them to remain pristine. This is also one of the reasons I have to force myself to lend out favorite books – because I’m not always sure I can trust my friends to keep them in pristine condition! 10. I judge you when you misspell words. This goes for everyone ever, but bloggers and authors get extra scrutiny. If I catch myself judging I give myself a talking to, but it’s a work in progress. Are any of these your confessions too? What are your bookish secrets? Outer space. The universe. The final frontier. No, this isn’t a review of Star Trek (though I did watch the new film for the sixth time this weekend). I mean real, void-filled-with-stars-and-planets space – when’s the last time you thought about it? It’s been in my mind quite a lot lately, what with the Mars rover landing and occasional sci-fi reads. Turns out that my latest read plunged me right into an astronaut adventure. Frank Cottrell Boyce’s middle grade novel Cosmic is by far the funniest and best book set (partially) in space that I’ve read in ages. Liam has always felt a bit like he's stuck between two worlds. This is primarily because he's a twelve-year-old kid who looks like he's about thirty. Sometimes it's not so bad, like when his new principal mistakes him for a teacher on the first day of school or when he convinces a car dealer to let him take a Porsche out on a test drive. But mostly it's just frustrating, being a kid trapped in an adult world. And so he decides to flip things around. Liam cons his way onto the first spaceship to take civilians into space, a special flight for a group of kids and an adult chaperone, and he is going as the adult chaperone. It's not long before Liam, along with his friends, is stuck between two worlds again—only this time he's 239,000 miles from home. Frank Cottrell Boyce, author of Millions and Framed, brings us a funny and touching story of the many ways in which grown-upness is truly wasted on grown-ups. Liam is about to start high school, and this is a problem. Why? Oh, because he’s freakishly tall, doesn’t have friends to speak of, and his best skills lie in the realm of computer games. Also, grown-up people seem to mistake him for an adult quite a lot. But to be honest, that particular problem does lead to some interesting adventures. It is Liam’s insatiable curiosity, enthusiasm for games, and outsize height that eventually land him in a…spaceship? Cosmic is Liam’s story, and it’s about growing up, figuring life out, and keeping your family and friends in your heart, even if you head on a universe-sized adventure. The story isn’t just Liam, though – it’s his family (a mum who worries and a dad who drives a taxi). It’s the drama troupe he’s been enrolled in to help him develop his social IQ. It’s his obsession with World of Warcraft and gaming and seeing the world in terms of quests and adventures. Then there’s Florida, a celebrity-obsessed fellow drama enrollee who lets Liam pretend to be her dad to get free things at the mall. And let’s not forget the other characters who make it into space and the reader’s heart. This is a book with charm and intelligence and accessibility. In other words? It has no downside. Cosmic is witty, smart, silly and endearing. It’s full of bits of wisdom and whimsy that will make you laugh and sigh and ponder the awkward reality of the growing up years – and force you to relive those moments when you wondered why parents act that way. It’s golden-hearted and beautiful. Recommended for: children of all ages, shapes and sizes (young at heart counts! ), and those looking for books about family, about space, about being gifted and not fitting in, about feeling alone in the midst of the universe, and about finding something good on earth to make coming home worthwhile. 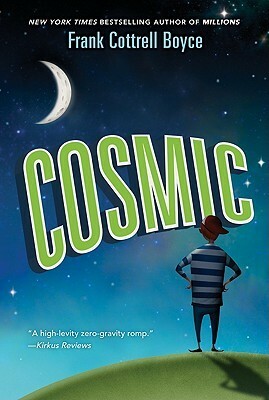 Fine print: I received a paperback copy of Cosmic for review from the folks at Walden Pond Press (HarperCollins). And then I went and bought a copy for my brother’s 26th birthday present. It’s really that good. Trust me. I originally posted this recipe in March 2010. At that point I called it Bill’s Crisp Chocolate Chip Cookies. The only change I’ve made this time around (aside from prettier photos) is to substitute chopped bittersweet chocolate chunks for semi-sweet chocolate chips. My friends know me as a baker (well, just look at the recipes tab, and you can see why). I bring raw dough over to their houses and cook it in their ovens. I show up to parties with trays of cookies. It’s a problem, and the only solution is more cowbell. Wait, wrong reference. 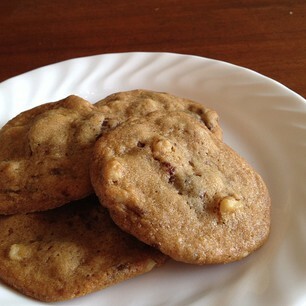 In any case, their most frequent ‘request’ is for these crispy chocolate chip cookies. They’re salty and sweet, and the nutty, buttery taste guarantees smiles. Preheat oven to 350˚F. 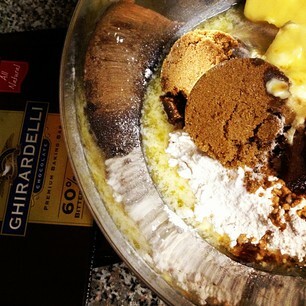 Mix all ingredients together except chocolate and nuts. 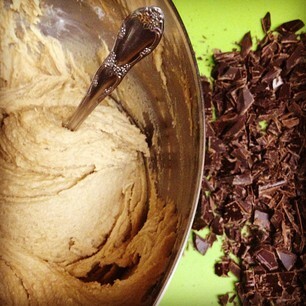 After dough forms, add final ingredients and blend well. 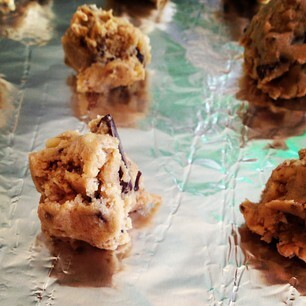 Roll dough into one-inch balls and place two inches apart on foil-covered cookie sheets. Bake for twelve to fifteen minutes, or until light brown. Yields approximately three dozen cookies. Note: to keep these cookies for more than a few days, either freeze or add a half piece of bread to the airtight storage container (to keep the cookies moist). Recommended for: chocolate chip cookie aficionados, those who prefer their cookies crisp, and anyone who doesn’t mind becoming addicted to a baked good. I am not always a make-from-scratch girl. Proof: this Tuesday I was in a time crunch and I opted for quick and easy over measuring and sifting. We needed a cake for my friend’s birthday dinner, and I was too tired to make one the night before. BUT. I wanted it to be special and a little out of the way wonderful. 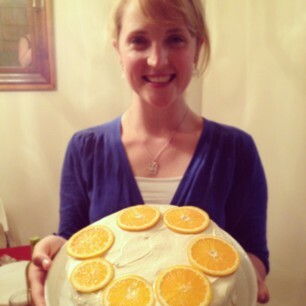 I rushed home from work, and a can of mandarin oranges, corner-cutting and a leisurely dinner (to allow the cake to cool) saved the day. Preheat the oven to 325 degrees F. Butter or spray a 9-inch round baking pan with baking spray, and set aside. In a medium-large bowl, mix all of the cake ingredients with an electric mixer for 1 minute, and then for an additional two on medium speed. 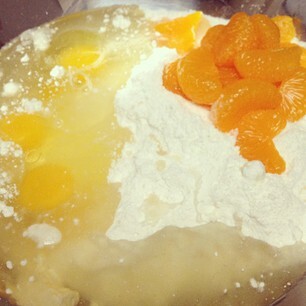 If mixed by hand, make sure that everything is blended well and oranges fall apart in the batter. Pour mix into the baking pan and place on center rack in the oven. Bake for 35-45 minutes, or until a toothpick inserted in the center of the cake comes out clean. Let cool on countertop for at least one hour. To decorate, upend pan on cake plate or platter, and gently pull pan away until the cake sits by itself, upside down. 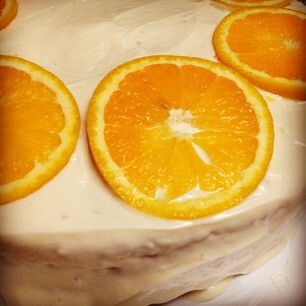 Top with icing, and adorn edges with navel orange slices. Serve immediately or cover and store in a cool place for up to three days. As you can see this is only a modified boxed mix recipe, but it drew rave reviews from my girlfriends, and they couldn’t quite believe I hadn’t made it all from scratch. 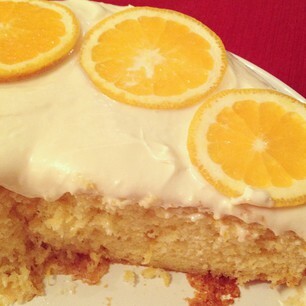 The oranges added just the right amount of texture and flavor to make the cake moist and delicious. I will definitely be making this again! Recommended for: something subtle and special when you don’t have time to spare, dessert for a group when you’re not sure chocolate or peanut butter will be welcome, and a light, delicious and summery sweet for any time. When I wrote earlier this summer about one of Anne McCaffrey’s Pern books, the reaction was swift and enthusiastic. Many sci-fi and fantasy readers cut their teeth on Pern and its dragons. However, aside from her short story collection Get Off the Unicorn, I hadn’t read anything by McCaffrey that wasn’t set on Pern. And as any Amazon visitor knows, once you’ve browsed or bought a title, you will be bombarded by that author’s backlist for all time. This is how I discovered Crystal Singer, published in 1982, and the first in a series by the same name about Killashandra Ree and the world of Ballybran. Killashandra Ree has spent ten years of her life studying to become a vocal soloist, and she has her heart set on fame and lasting renown. When she is told after her final exam that she doesn’t have the talent to realize her dream, she is absolutely furious. Amid anger, disappointment and shock, she is forced to consider, for the first time ever, what she might do other than perform. It is then that a coincidental meeting introduces her to a member of the secretive Heptite Guild, and the possibility of a future on a planet both puzzling and perilous. 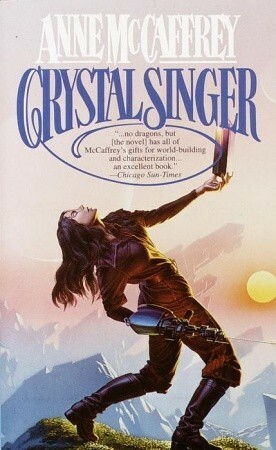 McCaffrey is known for her world building prowess, and she does not let the reader down with Crystal Singer. The Heptite Guild, Ballybran, and Killashandra’s home world are portrayed in such careful detail that they become characters in their own right. Ballybran itself is a marvelous, mysterious and dangerous world, and I believe I could read a book on its history, geography and geology very happily – and I mean that. It’s amazing what McCaffrey is able to do with description, as well as somewhat terrifying. In Killashandra Ree, McCaffrey has created a character who views herself as set apart from others. Killashandra is headstrong and stubborn, extremely talented and intelligent, and yet unhappy with the direction her life has taken. Her innate determination to be the very best is what leads her to life as a crystal singer, and that stubbornness and bullheadedness carry her on toward her goals. Killashandra isn’t immediately likeable, but she is such a hard worker, and so curious and passionate about every aspect of life, that you begin to see charm amidst the struggle. The coming-of-age aspect of the story, combined with the peculiar planet and the unraveling of its mysteries, places Crystal Singer firmly in the camp of YA/adult crossover sci-fi. 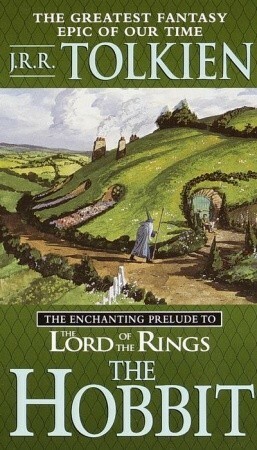 While I enjoyed the book and felt a strong compulsion to see it to the finish, it was not a runaway favorite. However, the strange life of crystal singers, and especially Killashandra Ree, will haunt me for a long time. Recommended for: fans of Anne McCaffrey, those who liked Sharon Shinn’s angel books and Alastair Reynolds’ Terminal World, and anyone who knows that (or would like to discover if) sci-fi with extensive world building is their cup of tea. One thing I’ve loved seeing in the past couple of years is the rise of steampunk young adult literature. I’ve had fun reading Scott Westerfeld’s Leviathan trilogy and watching Kady Cross take the genre by storm, followed newcomers like Meagan Spooner and Suzanne Lazear, and I am excited to attend the launch party for Tiffany Trent’s The Unnaturalists this very evening. That is just counting a very small portion of the YA steampunk available. Gail Carriger and Meljean Brook are two auto-buys for me in the adult market, and I look forward to new (and dangerous) additions to steampunk-land in the coming months, such as Adrienne Kress’ The Friday Society, Jay Kristoff’s Stormdancer, among others. Steampunk stories are always pure FUN for me to read. And I’d love to devote more time to them. 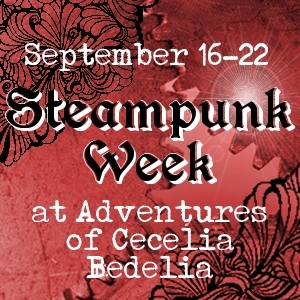 It is with this in mind that I’ve decided to host a Steampunk Week at Adventures of Cecelia Bedelia (my sister made me the lovely button). It’ll run from September 16-22, and I’m going to focus on one book each day from the list below. Pay attention, because this is also the giveaway list! Now, the good part (a.k.a. the GIVEAWAY): one entrant will receive a book of his/her choice from the list above. To enter, simply fill out the FORM. Giveaway open internationally (all books to ship via the Book Depository), will end on August 31 at 11:59pm EST. Winner will be selected randomly and notified by email. Good luck! If you are interested in featuring steampunk on your blog during that week as well, send me your links and I’ll do a round-up (or two). So tell me: is there a steampunk book on your radar that you can’t wait to read? Which one? 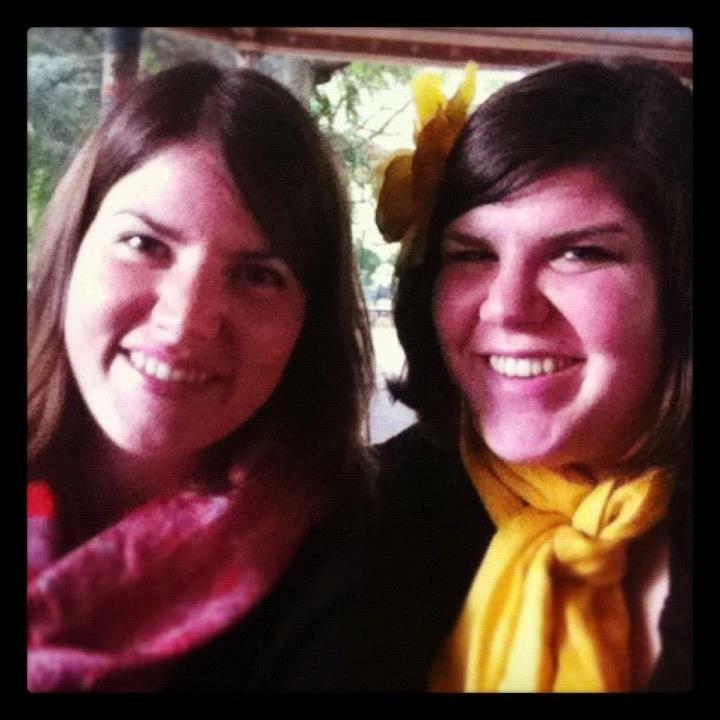 I’ve mentioned before that I have younger-sister-slash-best-friend-ever; she’s the one who inspired me to start blogging. Today, she’s posted on her blog about…ME. So if you’re curious, head on over. Warning: she loves me, so it’s biased. Aside from the odd post about family, Ginny does gorgeous crafts and nail art posts and is too funny, really, so if you’re into that, check out her blog. My roommate is a really nice person (you kind of have to be, to live with ME. ha!). She had a late July birthday, and I, swayed by her niceness and trying to think of delightful ways to celebrate her, decided to host a brunch for all of her/our friends. The menu was pretty easy to figure out once I knew we’d have a big crowd: lots of things you can make the night before or the morning of. Sausage and egg casserole, melon salad, bacon, biscuits, and my one special project, white wine sangria. I love sangria and have done so since a study abroad semester in Sevilla, Spain… but I had a bad experience with red wine a few years later and have mostly avoided it since then. Enter white wine, and all is well. 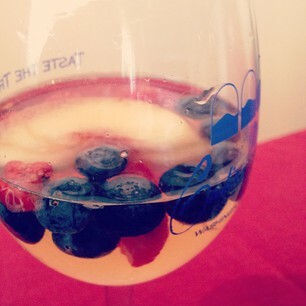 Let me tell you, white wine sangria is a perfect drink to accompany a summer brunch. I WIN! In large pitcher (or in my case, a large vase), mix wine, simple syrup, brandy, Triple sec, and fruit. 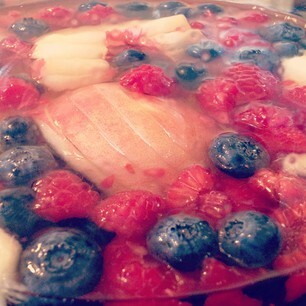 Cover and refrigerate for at least 12 hours. When ready to serve, add in seltzer water and stir gently to mix. Yields 6-8 servings. Enjoy! As you can see, I’m not the best photographer of liquids. 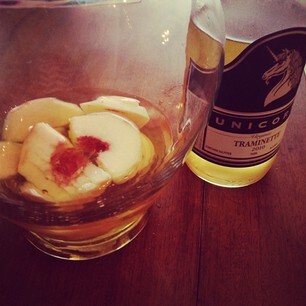 *sigh* Nevertheless, this was a popular and delicious drink, and I was very proud to have made up the recipe myself. Recommended for: summer garden parties, a refreshing adult beverage for the end of a warm day, and the perfect drink to set a happy, light atmosphere at any special event. I don’t need romance with my sci-fi and fantasy. I don’t need a trilogy to tell a story. But what I like? Great storytelling, an intelligent premise, and the potential for an epic, save-the-world sort of showdown. I mean, every once in a while. When I can get it. Which isn’t as often as I’d like. That may be why I’m looking forward so much to a book I don’t know much about – just that the synopsis sounds like it will be MY sort of book, and hey, that cover art is fantastic. 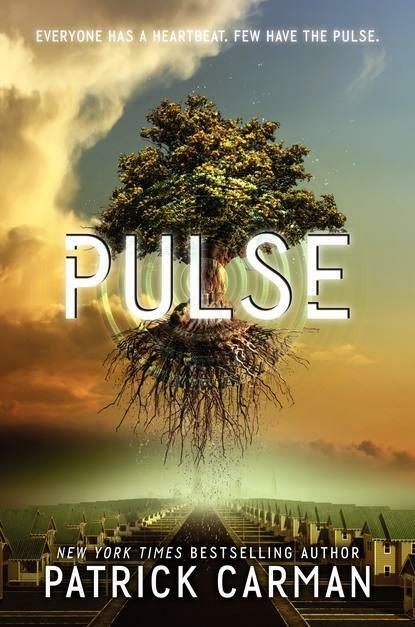 Pulse by Patrick Carman will be published by Katherine Tegen Books (HarperCollins), and will be released on February 26th, 2013. Steampunk and young adult books go together like milk and cookies. Or maybe I should say, like gears and grease? Steampunk is often about the possibilities of science and imagination – what the future and past can dream up together. And young adult is about coming of age, examining what it means to be fully human, and how we adjust to that reality. Steampunk YA is a framework with the addition of an inner focus. The melded genre often makes for extremely engaging stories. I thought Kady Cross’ opener The Girl in the Steel Corset was a fun, dizzy ride into that world, so picking up the sequel was a no-brainer. In New York City, 1897, life has never been more thrilling — or dangerous. Sixteen-year-old Finley Jayne and her “straynge band of mysfits” have journeyed from London to America to rescue their friend Jasper, hauled off by bounty hunters. But Jasper is in the clutches of a devious former friend demanding a trade—the dangerous device Jasper stole from him…for the life of the girl Jasper loves. More than ever, Finley Jayne will rely on powerful English duke Griffin King to balance her dark magic with her good side. Yet Griffin is at war with himself over his secret attraction to Finley…and will risk his life and reputation to save her. Sam, more machine than man, finds his moody heart tested by Irish lass Emily—whose own special abilities are no match for the darkness she discovers on the streets. The Girl in the Clockwork Collar opens with the ragtag band of teenagers from London (including the not-so-ragtag Duke of Greythorne) headed to New York City to rescue their friend Jasper Renn. Unfortunately, Renn was a bit of a non-entity in the first book, so the impetus and loyalty of the group was never fully fleshed out. I get why they’d go after their friend – I had just forgotten he even existed because he was not a major focus (and because I have a terrible memory, apparently). Some friend, eh? What follows when they arrive in New York is about what you’d expect: unknown and shifting emotions, intense action, some life-threatening situations, a crazy inventor and machines and talents that are far beyond the ordinary. Oh, did I mention the fighting? And pretty dresses. Also: corsets, the mysterious collar, sinister messages and gangs. In case you couldn’t tell, The Girl in the Clockwork Collar was a bit chaotic, fun, and heart-stopping in brief snatches. What I liked: the continued kick-it attitude of main character Finley Jayne. This girl is a force of nature, and she not only knows it, she’s proud of it. Part of that pride means getting her friends to acknowledge and accept her just the way she is, and she definitely makes progress on that throughout the book. Also high notes: the Five Points fighting bout, Wildcat, and the last 15 pages of the book. What I found tedious: straight telling (as opposed to showing) of the ‘past’ between Jasper Renn and Mei Xing. Nikola Tesla’s eccentricities, machines, and their dangerous applications, for another. The repetition of silly things – in the last book it was blushing, in this book it was how easily Finley could snap a neck. And striped stockings. But the biggest pet peeve? The absence of Jack Dandy. He was a bit of all right in the last book, and I can’t wait to get him back on stage in the next adventure. Cross has continued the series much as she began it: with stellar action and patchy suspense, but enough good fun to keep things moving along, and with developing trust, alliances, and an unexpected gem or two of a character to spice things up. I’ll continue to tune in to this series for more steampunk-y goodness. Recommended for: fans of action-packed young adult lit, those curious about steampunk and its appeal, and anyone in the mood for thrilling fights and adventure on the streets of an alternate New York populated with strange machines and treacherous men. Fine print: I received an e-ARC of this book for review from Harlequin via NetGalley. And I didn't read it in time, so I bought myself a copy. Ah well.